Welcome to the fourth and last day of previews for The Craft's Meow's May release. Today we are showing two sets by Karen Baker, Typically Teen and Retro Foundations. My first card uses Typically Teen, which is this month's Free with $50 purchase! This is a cool set that's perfect for the young people in your life. I stamped several of the images with different ink colors. 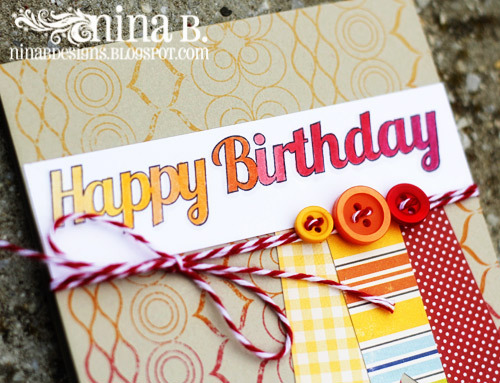 A simple sentiment in black, buttons, a small strip of patterned paper and twine finish the card. 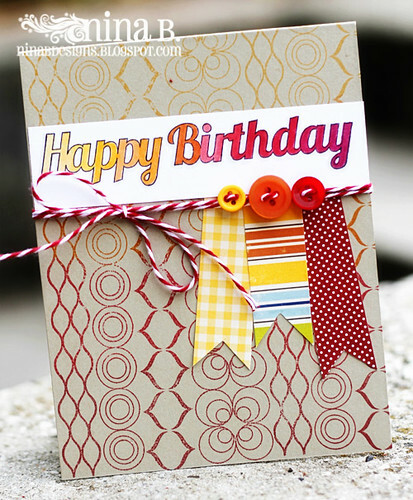 My next card features Retro Foundations, which includes several background/border maker images and matching sentiments. I inked a few of the borders in gradated colors from yellow to dark red. I followed the same color gradation on the sentiment, which was colored with Copic markers. Flags from October Afternoon patterned papers, twine and buttons are the embellishments I used to finish the card. Please make sure you check out the TCM blog for more inspiration and giveaway info. 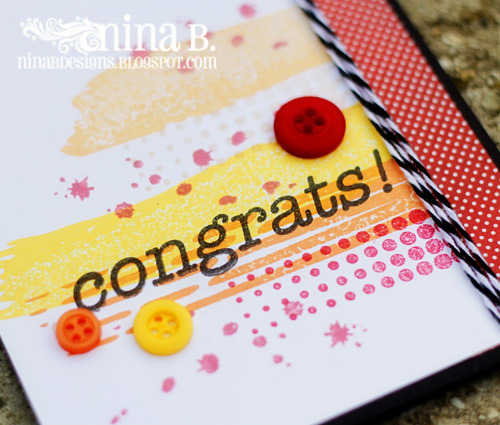 Speaking of giveaways, make sure you check out the NinaB Designs blog hop where there are 5 prizes up for grabs. 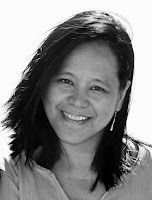 And tomorrow is our Release Blog Hop. I hope you can join us! Wow, these are fabulous, love the colors. Wonderful cards! 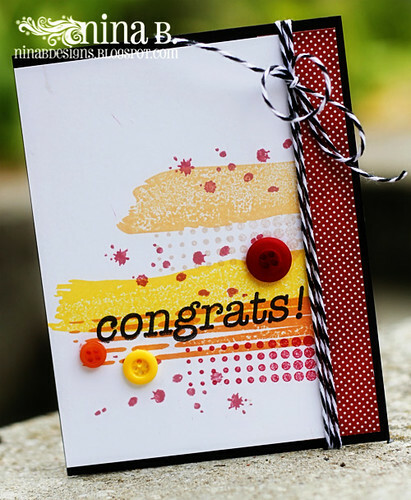 Love the color combinations and how you used all the different stamps in combination. Great work! Wonderful pops of color Nina! Both are great cards, Nina! Love the way you've layered the images on the first! You've showcased these sets wonderfully, thank you so much! Love the bright colors! .... so pretty! Wonderfully show cased...loving the colours...these are so very pretty! Gorgeous cards! I love the bright colors! Both cards look wonderful! Perfect for teenagers.